From the turn of the twentieth century until the years immediately following World War II, grassroots baseball built around local teams and leagues was an important participatory and spectator sport in Milwaukee and in other major northeastern and midwestern cities. Operating below the level of full-fledged professionalism, the game played by these teams was commonly called “sandlot” ball, the term derived from the roughhewn fields on which the games were played and watched. At the height of their popularity, Milwaukee sandlot contests regularly drew attendance in the thousands, occasionally even in the tens of thousands, and received extensive press coverage. Several factors contributed to the widespread appeal of the sandlot version of the proverbial “national pastime” in Milwaukee during the first half of the twentieth century, starting with the fact that in those days baseball was unquestionably the favorite American sport. In Milwaukee, however, the opportunities to experience high caliber ball being played, whether in person or vicariously, were limited. The city lacked a major league team between 1902 and 1953, and while the Milwaukee Brewers of the American Association were one of the more prominent minor league clubs, both the upper North Side location of its ballpark and the price of admission could deter potential customers. Moreover, the live broadcasting of games, which eventually came to nationalize and even globalize the transmission and consumption of sport, was only in its infancy: television did not yet exist, and only gradually did radio emerge to promote allegiance to the hometown Brewers and bring in baseball news from out of town. Sandlot ball was more than a substitute for the professional grade of the game that was out of reach for many Milwaukeeans. While major and minor league teams were commercial enterprises that only nominally represented entire cities, the sandlot teams and leagues competed in the name of neighborhoods, workplaces, schools, churches, ethnic societies, and individual and small business sponsors. 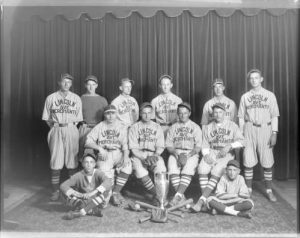 Many of the players on the diamond were friends, relatives, classmates, fellow parishioners, or work colleagues of the fans cheering them on, with the sort of intimate, intense tribal loyalty now found best preserved in high school sport. 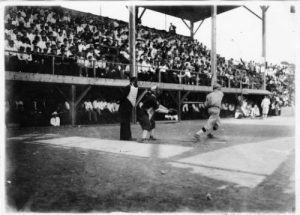 In addition, there were advantages of vicinity and cost: as a rule, sandlot fields were located within easy reach of their natural clientele, and the price of admission was modest, whether charged at the gate or collected by passing a hat through the assembled crowd. Sandlotters competed either as amateurs, typically as members of school or youth teams, or as semiprofessionals, who held down day jobs and played for pay on weekends. Most of the semipro players were unexceptional athletes who had no higher sporting ambitions or destinies than recreation, amusement, hometown glory, and extra spending money, but the Milwaukee sandlots graduated a fair share of their standouts to major league careers and even stardom. Of these, the most noteworthy were four native sons: Al Simmons (né Aloysius Szymanski), a hard-hitting outfielder whose play for the Philadelphia Athletics earned him a place in the National Baseball Hall of Fame, and doubtless the greatest ballplayer born in Milwaukee; Ken Keltner, a seven-time All-Star infielder for the Cleveland Indians; Tony Kubek, Jr., who played for three world champion New York Yankee squads; and Oscar “Happy” Felsch, who became notorious as one of the Chicago White Sox players banished from the sport for having colluded with gamblers to fix the 1919 World Series. Games were normally played on Sunday afternoons in the warmer months on the scores of diamonds scattered through the city, most of them concentrated on the South Side. The fields themselves ranged from rudimentary to relatively sophisticated enclosed venues with wooden stands, some with seating capacity of several thousands. More than a few teams became local fixtures for decades, bearing such colorful names as the Ryczek Morticians, Fox-Midwescos, Northwestern Malleables, Cudahy Peacocks, Tadych Furnitures, and Wisconsin Vibrolithics. Sandlot baseball also played a notable part in the acculturation of European immigrants and their descendants into the ways of their adopted land, in Milwaukee as in other centers where they settled. The ethnic second generation, born on these shores, and keen to exchange the customs of the Old World for those of the New, eagerly took up the most quintessentially American of games. This was encouraged by Progressive era reformers, who believed both that athletic exercise would uplift and invigorate the newcomers, and that baseball in particular could serve the civic purpose of teaching them democratic and American values. As an example, in the first two decades of the 20th century the Kosciuszko Reds gained local renown as the sandlot darlings of the Polish South Side. The popularity and patronage of sandlot baseball peaked during the Great Depression years, when frugal entertainment was prized, and games could draw crowds in excess of twenty thousand. The sandlot teams and leagues faded away after World War II, due to the arrival in 1953 of the major league Milwaukee Braves, who captured the city’s baseball loyalties, the emergence of television and other new forms of leisure activity, the changing tastes of the sporting public that gradually eroded the traditional primacy of baseball in American athletic culture, and shifts in demographic and residential patterns that weakened the old neighborhood identities and loyalties that had animated the sandlot rivalries. ^ George Reimann, Sandlot Baseball in Milwaukee’s South Side (Milwaukee: Robert W. Wiesian, 1968), 5. ^ Reimann, Sandlot Baseball, passim. ^ This theme is explored in the various essays collected in The American Game: Baseball and Ethnicity, Lawrence A. Baldassaro and Richard A. Johnson, ed. (Carbondale and Edwardsville, IL: Southern Illinois University Press, 2002). ^ Neal Pease, “Big Game on the South Side: A Milwaukee Baseball Mystery Decoded,” Wisconsin Magazine of History 88, no. 3 (2005): 28-39; Neal Pease, “The Kosciuszko Reds, 1909-1919: Kings of the Milwaukee Sandlots,” Polish American Studies 61, no. 1 (2004): 11-26. ^ Neal Pease, “Diamonds Out of the Coal Mines: Slavic Americans in Baseball,” in The American Game: Baseball and Ethnicity, 155. Pease, Neal, “Big Game on the South Side: A Milwaukee Baseball Mystery Decoded,” Wisconsin Magazine of History 88, no. 3 (2005): 28-39. 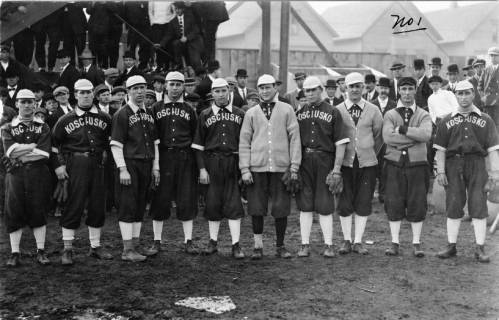 Pease, Neal, “The Kosciuszko Reds, 1909-1919: Kings of the Milwaukee Sandlots,” Polish American Studies 61, no. 1 (2004): 11-26. Reimann, George. Sandlot Baseball in Milwaukee’s South Side. Milwaukee: Robert W. Wiesian, 1968.